The bhi ParaPro EQ20 amplified audio unit with parametric equalisation allows you to customise the sound of your received audio and control which frequencies you want to boost or cut to suit your own hearing! The unit has two mono input sockets enabling you to connect up to two radios to the CH1 and CH2 input sockets respectively, or connection of a single stereo signal from an SDR radio, shortwave receiver, MP3 player etc, via the stereo input socket. Connect a single 4/8 ohm passive speaker or a pair of passive speakers to the left and right “Speaker Outputs” using the supplied banana plugs or 3.5mm plug to phono adapters. Use the “Source Select” button on the front panel to select the desired audio. The EQ20 is housed in a quality compact ABS case. There are controls for Power/Volume along with two parametric equaliser channels labelled Bass and Treble, with the Bass centre frequency being adjustable from 100Hz to1kHz and Treble covering 1kHz to 10kHz. Used together these controls provide two bands of ±10dB adjustment from 100Hz through to10kHz. 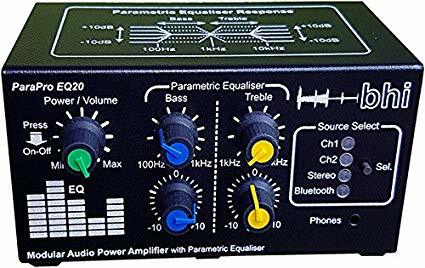 A parametric equaliser allows any specific part of the frequency range to be selected and adjusted. The most important feature is that it allows you to select which frequency to adjust. You can specify exactly which frequency to boost or reduce giving you greater flexibility and accuracy in setting the audio to suit your own hearing. This is especially beneficial to people with hearing loss. The ParaPro EQ20 unit is ideal for use with the bhi Dual In-Line, Compact In-Line and NEIM1031MKII units. It can also be used with the bhi DESKTOP & DSPKR noise cancelling speakers via the headphone socket on the front.